Last September we tried to escape the rainy weather in Austria and take a spontaneous road trip to Slovenia. 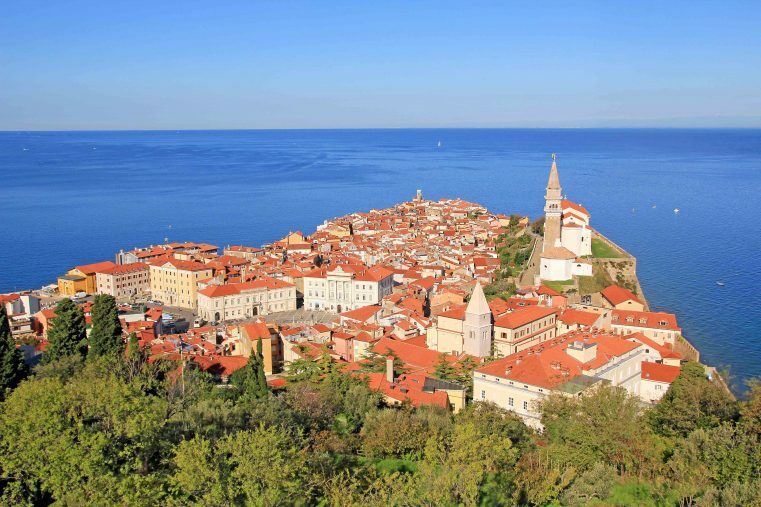 Among other things to see, like Bled and the Postonja Caves, we also visited Piran and the Slovenian Coast. 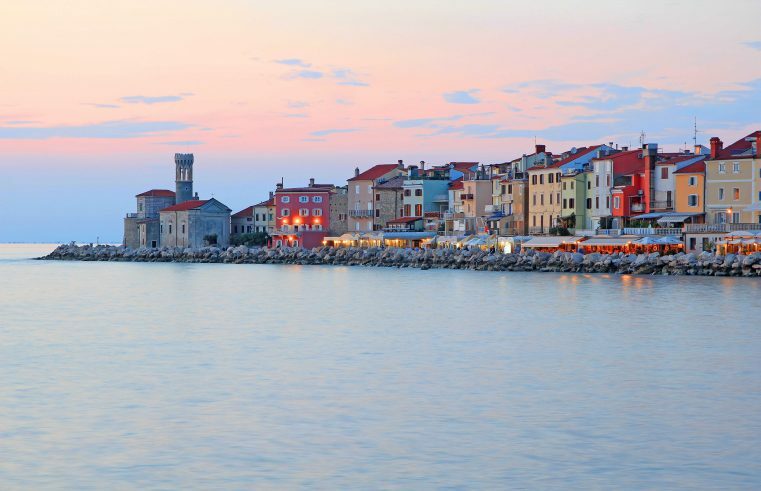 The Slovenian Coast is just 46 km long but it has lots of great attractions to offer! 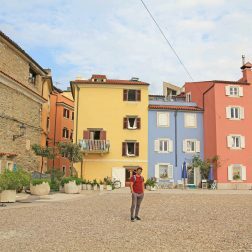 We really enjoyed the warm weather, bathing next to the cute seafront cafes in Piran, exploring the medieval old town of Koper, hiking in Strunjan National Park with its famous cliffs and visiting Izola with its charming Italian style. 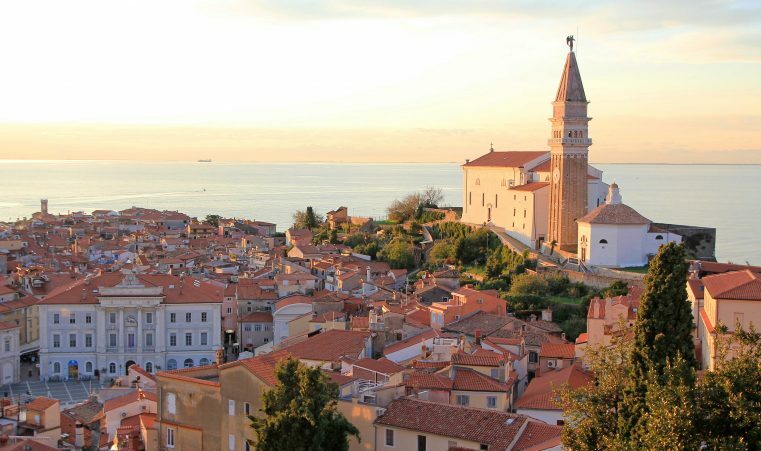 Located on a peninsula, Piran is with its medieval venetian styled town is the top place of the Slovenian Coast. It offers everything! 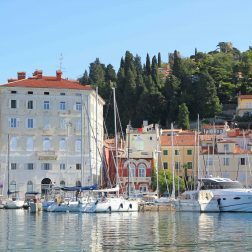 Nice beaches on the edge of the town, charming tinny streets, a great range of fantastic restaurants and a picturesque seaside. 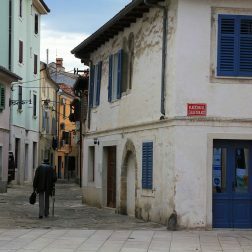 We loved sprawling through the streets, and just getting lost in this charming little town. There are so many winding streets, numerous churches and cute little squares to explore. 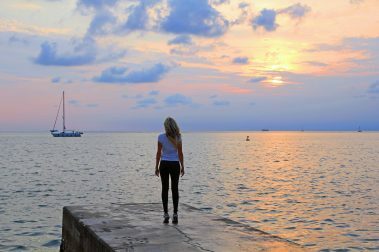 Most of the tourist just come for one day, but you should definitely stay longer. 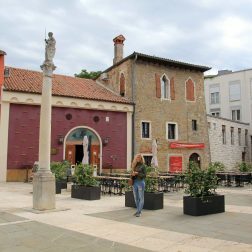 Pirans center is around the beautiful Tartini Square and the town is quite compact, so you can visit all sights by foot. 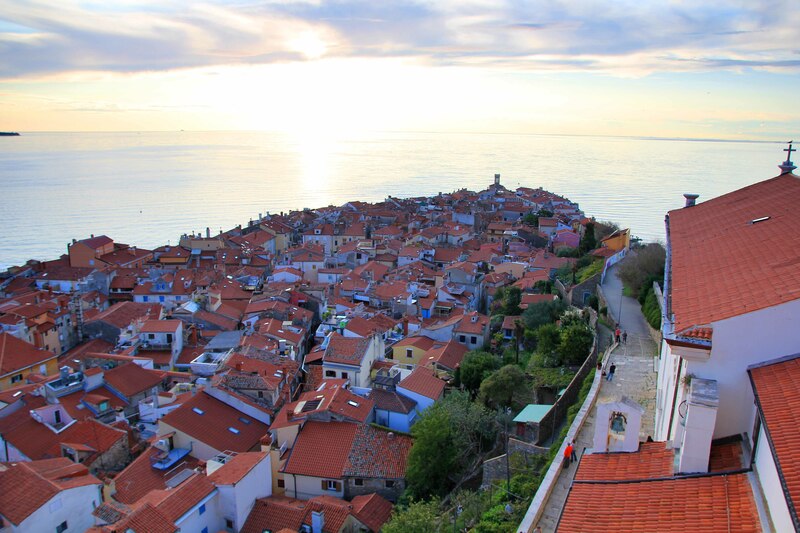 For the best view , you have to climb up the bell tower of the hilltop cathedral, the cathedral of St. George. 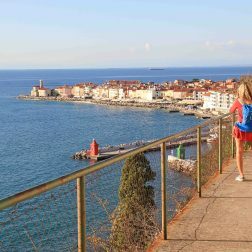 It’s the most important tourist attraction of Piran and from the top you will have the most fantastic view, overlooking the town center. Also worth a visit are the old Walls, you should be there in the morning in order to have the best light for taking pics. 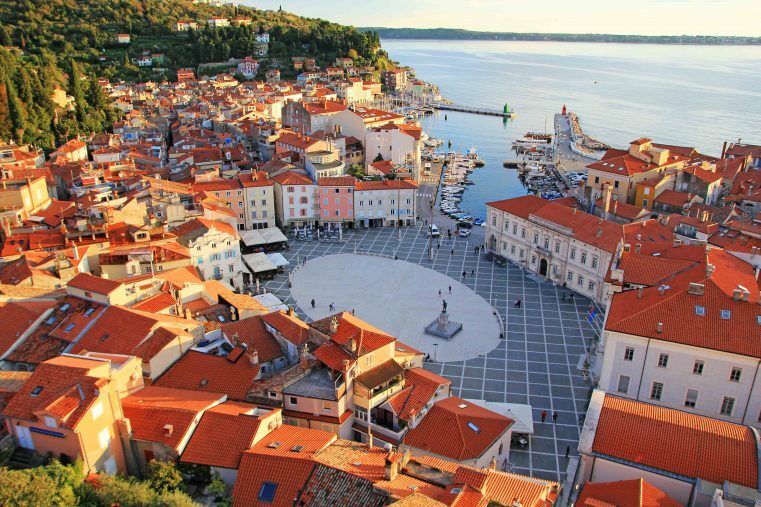 Just a few kilometers from Piran, is Portoroz, a touristic town with plenty of resorts. It’s well known for its health care centers. 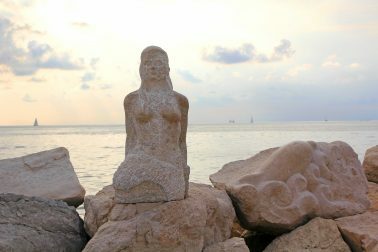 There is a big well-maintained sand beach, with lots of bars and restaurants. We stayed in the middle of both cities, so we had possibility to do a short walk in both directions. 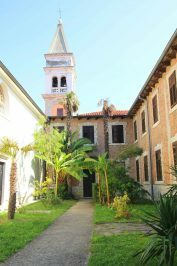 Visit the old center of Koper town! Kotor with its port is definitely not the most beautiful part of Slovenia, but it has a picturesque old town. 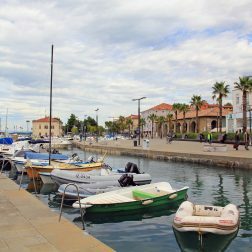 It’s so nice to spend an afternoon there, enjoying the Slovenian coffee in one of the seaside cafes, doing some shopping in the old town and visiting the sights of Koper like the Praetorian Palace and Loggia, the Carmine Rotunda church and the Cathedral of St. Nazarius. Walking through the beautiful Strunjan cliffs nature reserve was one of our coolest Slovenian experiences! The coastal views are just amazing, the nature is still intact and you can even see fish swarms in the clear sea. Furthermore, the most beautiful view you will have on the top of the Moonbay, which gives you the best nature photo spots. 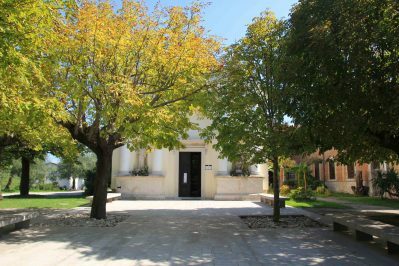 The starting point is not easy to find, there are no sites – go by car to the Parish Church of Maryˋs Apparition. From there you can start a short walking trail to the Moonbay. 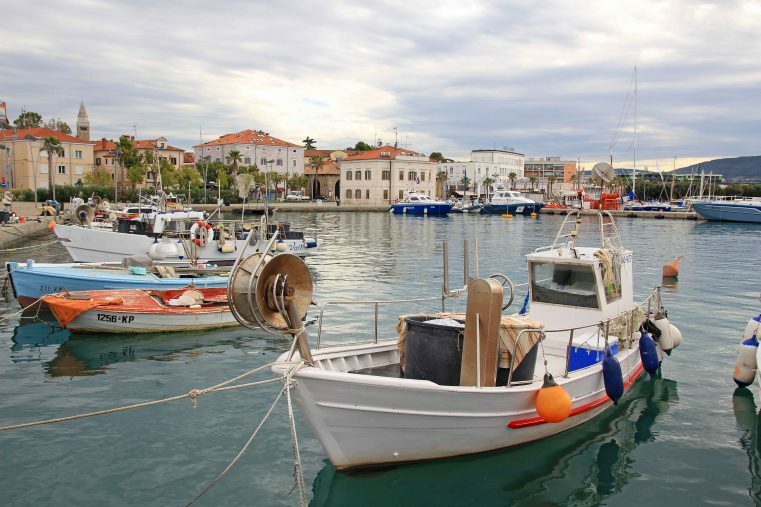 Just near, there is the little town of Izola, another charming seaside village. 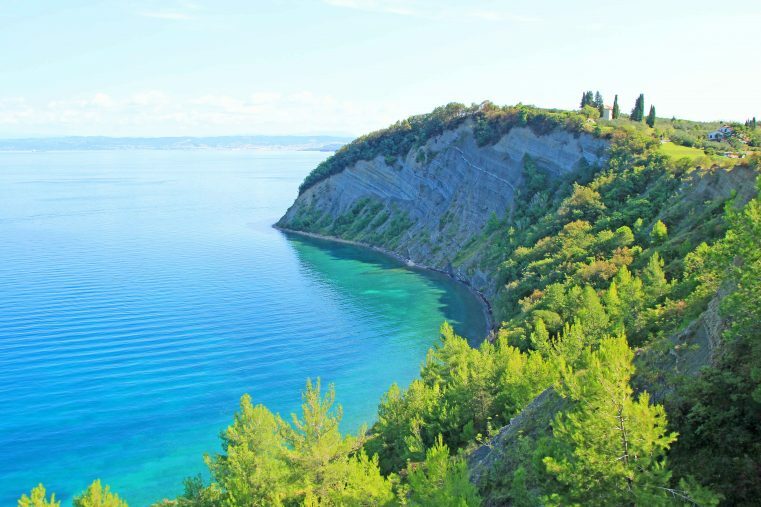 The coastal road between Strunjan and Izola is breathtaking – from there you will have a wonderful view to the coast of Slovenia. Where to eat: We had the best seafood in the restaurant Okrepcevalnica Cantina, try the gratinated fish wraps! What to drink: Coffee! Probably of the Italian influence the coffee is really delicious there. Where to sleep: We stayed in one of the several private apartments on the coast side, but there are also plenty of hotels. 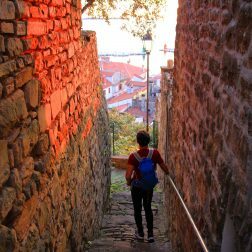 Best viewpoints: There are three main viewpoints, one from the tower bell, one from the city walls and one from the top of the street oljcna pot! Markets: Every year, on the fourth Saturday of the month the flea market takes place. It’s a market of antiques and home crafts. 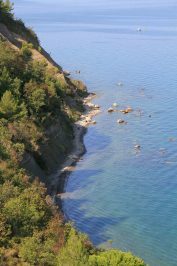 Top beaches Slovenian coast: The top beaches are in Strunjan, there you will have the famous Moonbay beach. 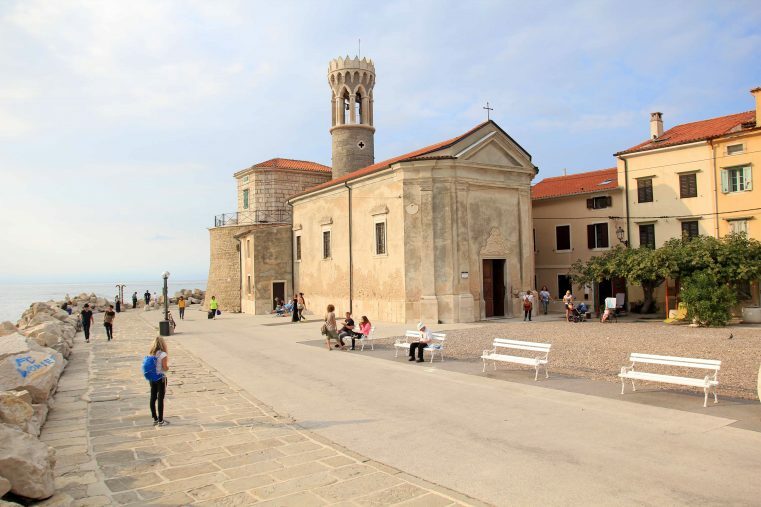 Additionally the seafront of Piran is also very nice for bathing. 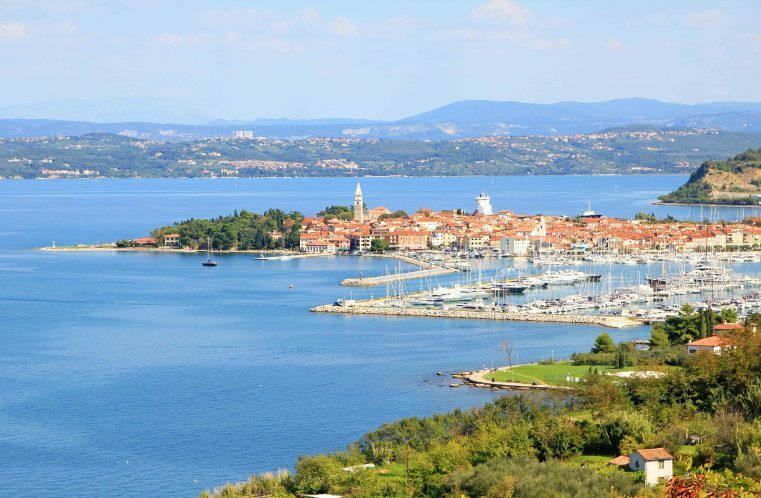 If you are looking for a sandy beach, you should go to Portoroz for swimming. I swear other parts of the world are so much more interesting because of their architecture in their creativity. They find it important to keep history and not destroy anything. I would love to check out this place. It looks beautiful. Slovenia looks amazing, and I could see the place, landscape and attractions so clearly with your beautiful set of collage photos. Really enjoyed reading your post. Eastern Europe has so many great places, landscapes and history to offer. 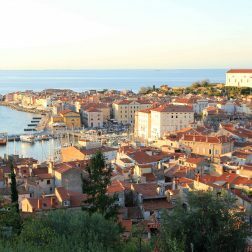 I loved Croatia and have Slovenia on my travel bucket list. Wow looks incredible! 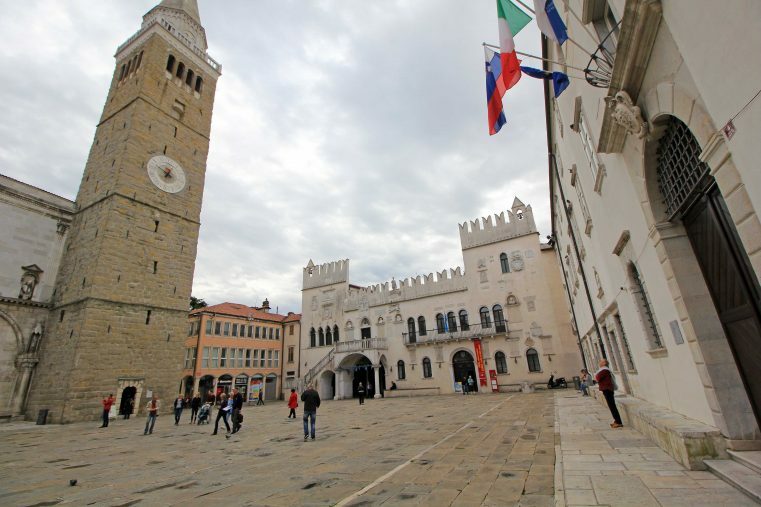 We too love traveling so thanks for these tips in Slovenia. Wanting to go there, especially to the seaside area. Will be sure to do the lookout from the tower bell. Wow these places look absolutely picturesque, I could look at those views all day. Such a great source of information packed into this post! Thank you for posting this! I feel like everyone focuses on the capital city and I never hear anything about the rest of the country. When I get to visit, I hope to experience the whole country, not just one city. This place is quite similar to Venetto in Italy. Also charming and beautiful and makes you wonder why people still opt to leave this place and live in other crowded and complicated cities. Hope the locals realized how blessed they are. Because of the money.I moved to Sweden, it is horrible and I am suffering every day.After I make some money I will come back.Not because Slovenia is my home, but because it is peaceful, has good food, good weather and open and nice people.Which I cant say for the land that I am living right now.Life in Slovenia is so free and easy, that is if you have money.No people, no crowds.